Jadaliyya aims to shape the debate in the west by providing a window into regional scholarship and knowledge. Where others see data points, they see "living communities and dynamic societies." The site currently publishes posts in both Arabic and English. Mamfakinch is run by a group of young Moroccan activists who founded the #Feb20 movement calling for broad political, economic and social change. It aims to highlight information often ignored or distorted by official media sources. The site currently publishes posts in French, Arabic and English. Nawaat, which means 'the core', was created to provide a platform for Tunisian bloggers and cyber-activists. It played a critical role in the Tunisian uprising and recognises that the "conquest of freedom is a battle to be fought every day. It currently publishes posts both in French and Arabic. An Arab Citizen, Bassem Sabry's personal blog. Bassem is Egyptian and his focus is on Egyptian current affairs. Bassem's most popular posts are the 'Life in Pictures' series, a photographic biography of Arab leaders with really interesting commentary: I found 'Muhammad Naguib: Life in Pictures' a particularly intriguing post about his removal from power by Gamal Abdel Nasser, Egypt's second president. Bassem is very inquisitive and poses serious questions that reflect the struggles in Egyptian society at the moment. This blog is great if you are interested in knowing more about the history of the Arab world, specifically North Africa. The blog could use a navigation bar at the top: it does, however, have a blog index in Arabic and English at the end of November. The writing is pleasant, very expressive, and easy to read. Bassem currently publishes in Arabic and English. He is very active online and is a regular tweeter of Egyptian current affairs. The Arabist, a well established blog, founded by Issandr El Amrani in 2003, which is a good independent source of reliable information. The Arabist is one of the first independent Egyptian blogs, and it focuses on Egyptian current affairs and culture but also on wider Middle Eastern issues. Its strength lies in the number of years it has been operating with an archive spanning 8 years. The blog follows domestic Egyptian affairs very closely with great analytical detail. What I like most about it is how interactive it is, with stimulating written, audio and visual material across all articles and categories. It offers a great selection of dialogue podcasts that tackle important current issues while constantly providing snippets of mainstream media coverage with constructive commentary. The layout is very pleasant to navigate and it is obvious that a lot of effort has been put in to making it user friendly. The writing style is professional and concise, the authors drawing on a wide range of media. An extremely active blog with a high volume of posts, this allows the reader to follow domestic affairs in Egypt as they happen. The Arabist publishes in English mainly and has a large following on twitter. Moftasa, Mostafa Hussein is an Egyptian activist, blogger, and trainee Psychiatrist in Cairo. He has been part of the Egyptian blogosphere since 1997 and is a writer on Egyptian current affairs. Although he does not post as regularly as other Egyptian bloggers, his very personalized posts talk about the wider implications of events on Egyptian society. Moftasa's coverage is quite unique. He is mainly concerned with the perception of certain events by the Egyptian public and the world. It is clear that his medical/psychological background strongly influences his topics and easy to read and witty writing style. I highly recommend browsing through older posts even though the site is not always easy to navigate. A sympathique post that caught my attention is a very genuine and straightforward one on admitting Michael Nabil to a mental hospital. 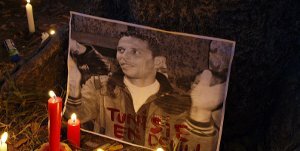 The blog offers audio and video clips on cases Moftasa is interested in, but also on general Egyptian issues. Moftasa publishes in Arabic and English and is very active on twitter. Levantine Dreamhouse, Abu Kareem is a Levantine dreamer. This physician's blog truly reflects the title of his blog. He mainly writes about Syrian current affairs, following recent events very closely, but also dreams about a culturally prosperous and democratic Levant (Greater Syria). His focus is on covering Syrian and Lebanese politics and culture, due to his background in the two countries, as well as the broader picture in the Arab world. What I most like about this blog is the type of journey Abu Kareem has been on, blogging from outside Syria, with an excellent analytical but personal writing style. He explains why he seldom posts in Arabic in reply to a fellow Syrian blogger that blogs only in Arabic ( Sat 13th Oct. 2007). His reply struck a cord with me and made me even more interested to delve into the archive and read. Another post that resonated well with me is entitled 'Peace Through Gastronomy' where he reposted a review on Culinary Orientalism as a gateway for understanding Middle Eastern culture both internally and externally. Although the blog is pleasant and easily navigable, it may need a navigation bar at the top to perfect it. You can find many links to useful websites and blogs on wide ranging Syrian topics on there. It also lists a few other blogs and websites from across the Arab world. The author posts regularly and is very responsive to comments.